The start of the third quarter showed a turnaround from the previous quarter, with renewed global risk appetite supporting the local bond market and currency. President Ramaphosa’s investment campaign also received a big boost following the successfully-hosted Brics summit. Enthusiastically, more investment commitments were secured, resulting in foreign investors stopping the outflows from South African bonds and locals using their growing cash piles to buy. This was further supported by SARB MPC deciding (unanimously, again) to keep the repo rate unchanged at 6.5% with a more hawkish tone than the previous meeting. The above developments combined with rand strength helped South African bonds to the top of the emerging-market pile in US dollar terms. In fact, rand-denominated government debt returning 6.5% in dollar terms during July, the best performance out of 19 major emerging markets tracked by Bloomberg. However, despite the renewed risk appetite for many South African assets (financials and bonds benefiting the most), the FTSE/JSE All Share index ended the month lower, falling by 0.3%. Influencing this outcome were rand hedge shares such as Naspers (down -6.7%) and Glencore (-12.4%), placing pressure on the upside participation of the market. 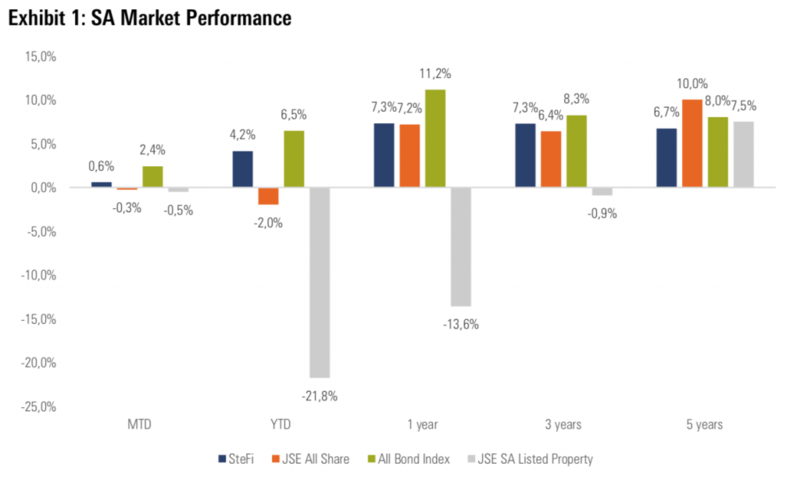 On a sector basis, we also saw a significantly diverse return profile in the JSE. 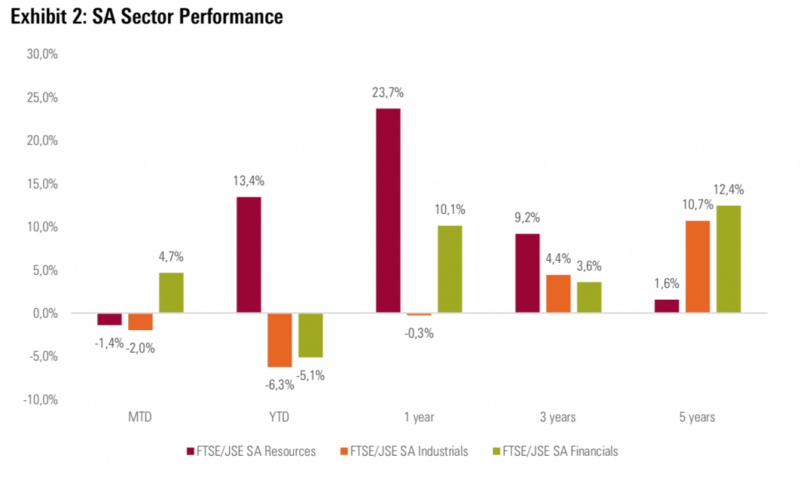 The best sector for the month was financials up 6.6% (year to date (YTD) -1.6%), meanwhile industrial ended the month -2.2% lower (YTD -6.0%) and resources fell by -1.4% (dragged down by a stronger rand, although YTD returns are still strong at 16.8%). Globally, trade tariff negotiations still dominate, with the US-EU deal seemingly easing some of these tensions. 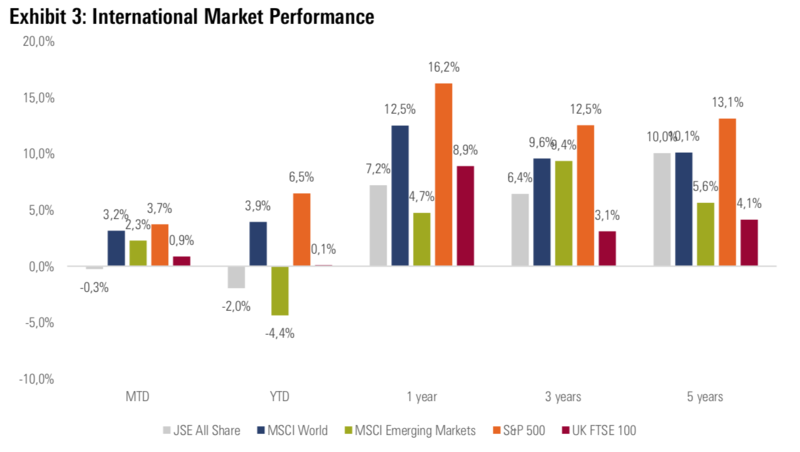 Global markets had a solid month — the MSCI World and MSCI Emerging Markets were up by 3.2% and 2.3% respectively (in US dollar terms). At a portfolio level, the net outcome for the month was largely flat due to diverse returns from underlying assets classes. Among equity allocations, most managers delivered returns in line with the equity market (depending on their exposure to the financial sector), although offshore allocations detracted from performance due to rand strength. Conversely, the best performing asset class for the month was bonds, where we saw bond and income funds contributing positively to performance. While the rand has been strong more recently, the market continues to be influenced by U.S. dollar strength. Many investors have cited this as a reason for emerging market relative underperformance (specifically a liquid market such as South Africa), despite our analysis showing a lack of fundamental deterioration. In this regard, we always circle back to what we are trying to achieve: helping investors reach their goals. We can best do this by adopting a valuation-driven approach that looks through short-term noise and is risk aware (especially willing to digress from peers when we see concentration or valuation risks). While we believe this is the right approach to managing money, we don’t profess any skill in predicting short-term market movements and – consequently – there are many circumstances where our portfolios can underperform benchmarks or peers for as many as four quarters in a row (possibly more). Such periods are most likely to occur when assets that our analysis shows are very overpriced continue to become more expensive (for example, U.S. equities currently). We hope this helps you to understand the world through our lens.